This week’s chapter of our weekly series of translations covering Naoko Yamada’s career reunites her with the scriptwriter Reiko Yoshida. Enjoy the long insight into the production of K-ON! The Movie! K-On! The Movie opened on December 3rd, 2011 and the film spread to be seen by over 1 million viewers in theatres. However, all director Yamada had planned when first hearing about the series being adapted into a movie was fragments of ideas. How was this movie created from nothing? – When did you hear that the K-On! series was being adapted into a movie? Yoshida: I think that wasn’t told to us until I had finished the last of the scripts for the TV series. Yamada: It certainly hadn’t been announced when the storyboards for the bonus episode “Visit!” (included on DVD/BD v9) were being completed. However, I recall the topic being brought up to the cast after recording dialogue for the final episode, so it was determined during the broadcast of the second season. – So we should assume that perhaps you made the bonus episode where everyone gets their passports prior without thinking this would affect the movie? Yamada: A ton of people who saw that episode say “Wasn’t that foreshadowing going on a graduation trip?” assuming that very conclusion, but we didn’t make that tale thinking in advance at all. Yoshida: It was created without realizing what that would mean for the movie. There was no day that came where we thought we could use this for the film’s plot. – Director Yamada, what ideas did you have in mind when you first heard about the movie? Yamada: I don’t recall any clearly, but I felt like “I want to make it.” Afterwards, I had meetings with Yoshida-san and Producer Nakayama-san where we would exchange ideas on what the movie would be about. Two ideas that I suggested were a story in the school and a story travelling overseas. – What would the story in the school be? Yamada: It would be a similar story to where the seniors made the song for Azusa. I thought about warm comedic ideas like the seniors hiding their plans and acting in secret. – Eventually, the movie became a tale combining the song making process and the graduation trip. Yamada: It did. We had a lot of ideas concerning the international trip too. For example, we had an idea where the girls went to America and they would be walking around while all these explosions would be around them making it so flashy and amusing. Yoshida: I remember one where Yui’s guitar was taken away and so the entire club had to chase after it. Yamada: That’s right. 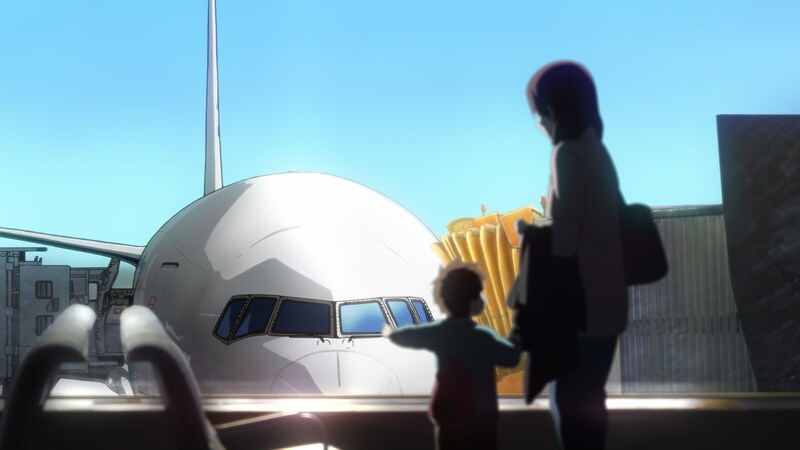 In order to somehow get everyone travelling to a foreign country, we planned that Yui’s father would take Giita on his business trip and then everyone would follow after him. Additionally, we had stories where everyone would visit Tsumugi’s holiday house in Finland, where they set a goal to go to the world Air Guitar championships, and where they headed on a trip to head to find the world’s northern-most fast food restaurant. – Each of those sounds immensely entertaining. Yamada: (laughs) There was also a pattern of ideas during the spring break following graduation. It didn’t stop there either; there was an idea to do a university edition as well. It’d start serialization once the movie’s story would begin. – What was your personal recommended idea? Yamada: A nonsensical tale of having Yui thread a needle for an hour and a half. (laugh) There’d be all kinds of suffering as the thread wouldn’t go into the hole, but at the end everyone would go “You did it!” once it went in. The reactions from others weren’t favorable though……. (laughs) Incidentally, Yoshida-san mentioned doing a story where they did a musical performance in a kindergarten and I remember Nakayama P definitely joking around about overseas. However, “I want to see them wear their uniforms” was a major premise of the tale, so we began thinking about stories revolving around that theme. – So that was the reason they carried their uniforms with them as they headed overseas. Though, wouldn’t there be some difficulties wearing those overseas? Yamada: Along those lines, I felt the girls’ emotions upon going on a graduation trip became clearer. It felt like this was only one part of how they would make memories together. However, I had some weird concerns too. Like I didn’t want the staff to be making this film just because they wanted to travel internationally. Yamada: Thinking back now, I did think about those kinds of worries. I didn’t want to make an adult type of K-On! film. Along with that, I thought at times how to make it so that it wouldn’t have the scene of the people working on it. It felt difficult to think of a story where the girls travelled internationally. – Since this was a movie, were there any circumstances which made you say “No good”, director Yamada? Yamada: It would’ve been fine if it was simply the girls heading overseas, but, putting me in their position, mere students heading to Europe is something spectacular. Especially since I’d only been to Europe once in my life. I had such an incredibly far place in my mind before going. – After that portion, didn’t I hear you say that you wanted to put in the story behind the song “We met an angel!” back at the school? Yamada: Yes. I wanted to tell a story at the school. So, I questioned if it felt right to go back again in the past after they had already graduated to tell another story, but as I thought that if we told the story around that song, then we could possibly show a side to the seniors that hadn’t been seen before. – During production, you both went to London to scout locations for the film, correct? Yamada: The first time we went was a script hunting trip to see the sights and decide on various scenes for the film and specific locations and then afterwards we went again for photography/material collection for location scouting. In total, we just went twice. – Were the trips for this film your first trip to Europe? Yamada: This was my first time visiting London and England as a whole, but I had visited Holland and Belgium previously. Yoshida: This was my second time. I’ve also been to Paris and Italy in Europe. – How was the schedule for your scouting trips? Yamada: It was like we’d make a broad request and then go from there. Yoshida: Due to our coordinator crafting such a wonderful schedule for us, we were able to go around so many different places. However there was a lot of walking. I think we walked all around London. – I saw the video feature included on the BD/DVD, “Naoko Yamada in London”. Of course, you weren’t able to include the entirety of your visit into the film, were you? 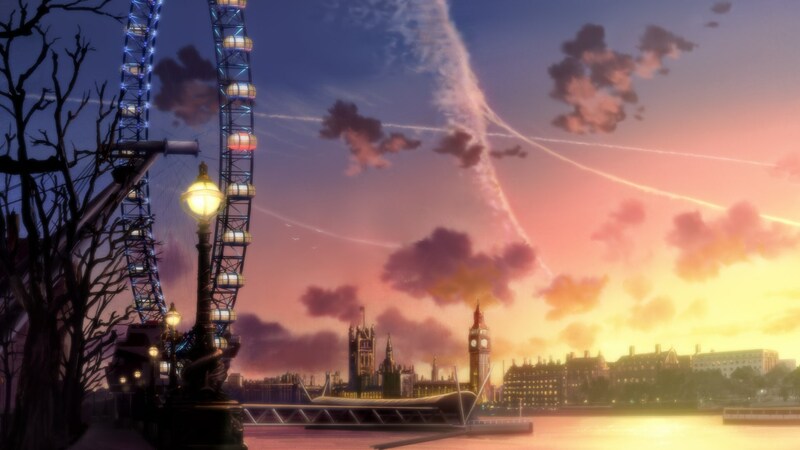 Yoshida: I tentatively placed a map of London across from me and mapped out the course in my mind, so it did influence how the script was written. However, in theory it should be impossible for the girls to cover it all in one day…. probably (laughs). Yamada: You may be able to see places from the location scouting for an instant during the scene where the insert song is playing. Each place had its own cut, so the location hunting was used quite thoroughly. – Did your group stay in the same hotel that was shown in the film? Yamada: During the script hunting, we spent one night at the hotel the girls went to first, the Hotel Iblis London City, but we stayed at the Ibis Earls’ Court the entire time for the location hunting trip. – What were your impressions of London? Yamada: I really love the city. It’s filled with only things that fascinate me like music and fashion. However, when we traveled there, London was in the middle of a record-setting cold spell. Each day was -5 degrees. Yoshida: Snow was also falling because it was so cold. Yamada: But the snow landscape itself was so pretty. It felt just beautiful on the magnificent streets of London. Usually there isn’t a lot of snow in London, so we were extremely lucky to be able to experience the snowfall ourselves. Also the vehicles to travel in were very huge, so it was very convenient to get around . The street sizes were relatively big, so the girls could be lost and still be able to find their destination. I was relieved they wouldn’t become lost while walking around. London itself has a very small quaint feeling to it. It really fits the K-On! atmosphere well. – The script that Yoshida-san wrote was quite large when you see it in person. Yamada: I’m not sure what the standard is personally, but when I saw it from her, I thought there were a lot of pages. Yamada: That explains it! I kept thinking “This never seems to end” when I was drawing the storyboards. I’d draw and draw and yet the goal line never seemed to appear. Yamada: It was really long wasn’t it? Yamada: Did you know what you were handing to us? – What were your impressions of the first script that Yoshida-san wrote for the movie? Yamada: There were a lot of words, but beyond that, the stage directions really troubled me when making into the storyboards. One line would be written smoothly and then it smoothly wouldn’t end. (laughs) These were just ordinary life scenes and yet due to the never ending depiction, it was intense to put them into visuals to convey that information to the viewers. These directions were packed with atmosphere, feelings, aura, sense of closeness; they were amazing to read. Just like the TV series, I had to scoop up as much of the thoughts and intentions that Yoshida-san packed into the script and devote my entire body’s effort into thinking how to make it into visuals/expressions. Yamada: But while I challenged myself “I’m not going to let her win,” the actual work itself was quite fun. What a dense script. Yoshida: K-On!’s scripts have a lot of depth to them. There’s nothing like battles or adventures in them; they’re honestly just normal life depicted with a lot of depth. Yamada: I think that normal life would have a lot of depth anyways. Whenever you really look at an ordinary story, you’d see a lot of inbetweens and a lot of labor behind it. You see it most when people are talking and you notice gestures you’re used to seeing. If there’s anything weird, you feel strange watching it. 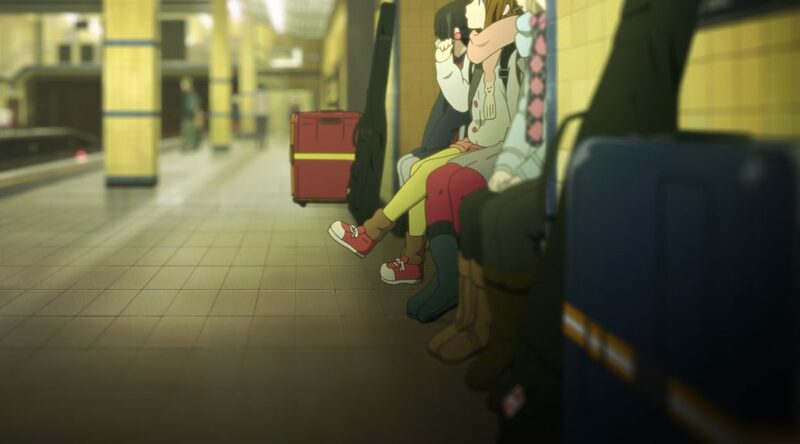 Therefore, as the number of everyday scenes pile up in K-On!, the scripts and storyboards keep adding depth to them. It feels like the movie takes that to the extreme. – What kind of ideas did you have for various jokes and references to the TV series in the movie? Yamada: There were some in the script that Yoshida-san wrote and I also added a fair amount myself. During the TV series, there were a lot of references and visuals that were stuffed in, but there were also a lot of scenes and gags that weren’t included there that I wanted to scoop up for the movie. While I was drawing the storyboards, I also included some things that popped into my head there. – The reason why Yui was late for the graduation ceremony was revealed. Yamada: The reason itself was settled to be that Yui wanted to touch Guita in the ceremony and so she was late, but it wasn’t finished in the TV series. For the movie, we could take that kind of point and expand on that bit to complete it. It was quite entertaining. As I was working on it, I felt nostalgic. “These girls would do that kind of thing, wouldn’t they?” I think if you watch the movie and TV series back to back, you’d be able to enjoy it more. The final scene was a shock not seen since “Give me wings” in episode 1. Yoshida: Actually, I really love that scene. For me, it really symbolizes what work K-On! is. It really leaves an impression on you. – Director Yamada, what were you very careful with when turning the script into storyboards? Yamada: Making the movie enjoyable and logical for people who were seeing the film for the first time and for people unfamiliar with the setting and characters. For example, after the “We met an angel!” scene, Azusa says “It wasn’t very good!” People who weren’t familiar with the manga or TV series wouldn’t understand the meaning behind that phrase. But I was also careful that, when putting in things that have been built up to the movie, new viewers would be able to make conclusions. For that, it would be like the photograph and flower that Yui hands to Azusa. I felt people familiar with the TV series would feel that completes the moment while people who didn’t watch it wouldn’t feel uncomfortable in that scene. – Nearly all the characters appear in the movie, don’t they? Yamada: Nakayama P says it’s “because it’s a festival.” We included everyone so that all the fans would be able to see their favorites. – Wasn’t it difficult to include every single character? Yoshida: Since there were scenes at the school, it wasn’t impossible for them to appear. Pretending to be Death Devil is a symbol of K-On! – This movie is divided into 4 parts. Let’s talk about each one, starting with the first part. Yamada: The open is certainly striking, isn’t it? I really love them pretending to be Death Devil and fighting amongst themselves. (laughs) It’s certainly representative of K-On!’s stupidity; that constant joking sense that always comes out. When you’re a student, you can overdo things and be alright. At first, Azusa is surprised but she later starts to think they’re idiots…. – They just randomly switched to heavy metal for some reason. Yamada: I think they’re the kind of people who saw heavy metal, hard rock, or something like that with the motions and thought it’d be a good chance to try something like it. (laughs) Ricchan has that aura like she went to study those motions. Mio also moved like she was trying to play it. The person with the biggest problem has to be Tsumugi though. She must be thinking “How could I remember this? !”(laughs) However, the girls aren’t doing this for themselves; they’re pretending to play for someone else. If you take a glimpse of this scene, you’d think it’s just a gag, but really it’s a spot that shows how they act for everyone else. It feels amazingly deep and that’s why I really love it. – Did you both think of a way to start the film like that opening from the start of development? Yoshida: Right. We thought about how to show something that felt like K-On! from the very start. – The scene in the hallway where the girls take out the trash is quite nice. It feels like the photographers did their best to make the light appear so beautiful. Yamada: They really thought about how the scene would be set and where they wanted the light to be so that it wouldn’t appear in any unlikely places just like live-action shots. Due to all that work, it became a scene that exaggerates their upcoming graduation, a moment where you get a glimpse of them becoming adults. – In that scene, Yui drops candy wrappers along the hallway. It feels related to the scene in the C-part where the sleepy Azusa starts to follow the wrappers on the floor at the hotel among other things. Yamada: Being able to draw out that “Ah!” sensation is certainly something K-On! does while it also feels like this is something Japanese as well. Yamada: I just thought it would be a nice thing to spread some gravel along the bottom of Ton-chan’s water tank for the movie. (laughs) When the photography staff asked me what I would like for the movie, I requested “wouldn’t it be nice if we made the gravel look gorgeous?” And then I got a “Uh, that gravel, right?” in response. (laughs) When we were at a music meeting for the movie, I was asked “What pieces from the TV series would you like to use again in the film?” I replied “Please use the ‘Have some tea?’ and Ton-chan’s theme again.” (laughs) Ton-chan is important. Being able to see his close-up on the big screen was certainly indescribable. – Yoshida-san, isn’t the scene where Yui has “Europe” stuck on her face one of your favorites? Yamada: You get so excited over those things. (laughs) Also, Yui couldn’t escape punishment after fixing the contest, so that scene was created. – That scene wasn’t included in the script, right? Yamada: I was inspired from the script and the reply I got for that scene said to do it if I felt it’d fit. – The line “Let’s play some old maid” was said by Azusa in the film, but in the script, it was by Yui. Yamada: When we saw things begin to move, it felt like that was something Azusa should say, so it became that kind of meaningful line through the exchange between Yui/Ritsu. – Continuing onward, the B-part minutely depicts the process of getting onto a plane. Yamada: This was immensely fun to create. Yoshida: It’s just something people do and yet I also had so much fun writing it down. Wintery morning, heading off to meet a deadline, the whole atmosphere, everything was marvelous. Yamada: That was quite an unusual photograph with her and Yui together. In the first season, those two would’ve easily been together, but there were so many photos of Yui/Azusa in the second season, so you didn’t see Yui/Mio much. It felt very nostalgic for me when I was drawing the storyboards. 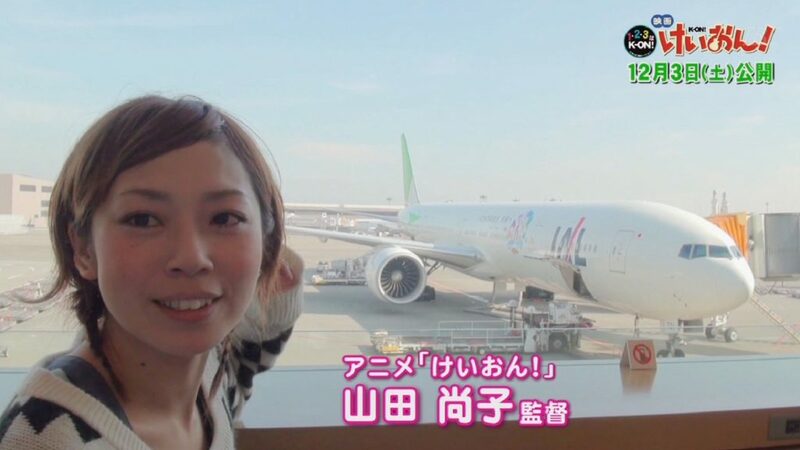 – Yui, Ritsu, and Mugi also played around with the performer/media gag in the airport. – Incidentally, did you research the arrival times for the planes? Yoshida: Yes. I have no idea when they are arriving now, but I reviewed the flight schedules that were in use at that time. – The airport itself is minutely detailed. Did you scout it as well? – Even the insides of the planes look very detailed. Yamada: We also took pictures there in the provided time. – In the script, the five girls are seated in the same row. 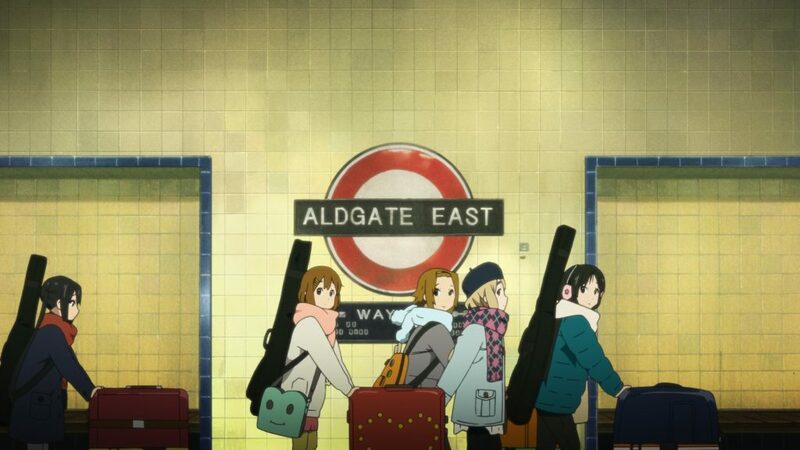 However, in the movie, Ritsu/Mio/Mugi are in one row while Yui/Azusa are in another. Was that due to the location scouting? Yamada: Right. As we were scouting the plane, those were the seats that put all five of them close together. – The exchanges in the airplane were quite entertaining. – It felt so real when the seatbelt light disappeared. That feeling of relief when people can stand up and the entire plane feels relaxed. Yamada: I really love that time. Yoshida: It’s something you don’t usually see in anime films. – That scene with the flight attendant bringing food was also minutely depicted. – I was a bit disappointed we weren’t asked if we’d like a Western or Japanese style meal when Yui asked Beef or Chicken. Yamada: That was a little cliché gag that the girls promised to do, but reality shocked them a bit. It was cute. – The movie had a lot of scenes where Yui and Azusa were a combo, didn’t it? Yamada: There were so many times where Yui headed to Azusa during the training camp, vacation, etc, so I wonder if it’s just natural for her now. (laughs) Also I love the set of Ritsu/Mio/Tsumugi. The three initial members of the light music club are together. I could just hear Tsumugi asking Mio “How do you use this remote control?” That spontaneous mood is quite nice. – By the way, whose idea was it to do the “Azu-cat” gag that starts here? Yamada: The scene Yoshida-san wrote with Yui calling out Azu-cat was so explosively, or rather revolutionarily cute. (laughs) It’d be a waste if it was only used once, so I made it into a running cat gag. It could be some way to tie themselves to their destination somehow. – Let’s move to the C-part. Starting from their first night and going until they’re traveling around London. Any thoughts about this part? – That’s also in the second season too. Was it surprising that Ritsu could be so sensual? – There’s also some surprising points for the other members as well in the film. Like Tsumugi being shown to be unreliable in a foreign land. Yoshida: She’s surprisingly stubborn, that Tsumugi. – It was only her that could go “Excuse me!” and have the restaurant workers prepare a keyboard while everyone else was still in shock. – Conversely, it’s the shy Mio, who would step forward very much, who proves to be very reliable. – And finally let’s talk about the D part. Yoshida: It has the classroom concert scene. I absolutely love that scene. Yamada: The concert with the morning light coming through the windows gives it a fresh feeling. It’s a dreamy visual. Yamada: That scene was originally outdoors, but it was moved indoors for the story. However, I was thinking that “ah, it feels like they’re going to confess here.” So of course they would be nervous, anxious, and full of worries. They’d definitely want to look up into the sky. There’s a rooftop near the clubroom. So I thought why not have them show their impatience by running out there? – Finally, what were your impressions of the film once it was complete? Yamada: Honestly, when I went to the preview I was feeling anxious. “Will it be alright….” I mean I had put my whole strength into the work, but was it good enough? Would my thoughts be communicated well? I didn’t know what to expect. I remember worrying about things like people being too embarrassed to tell me what they felt. – And it became very popular at the preview screening. Yamada: That made me happy. It really felt like everyone who made this film put all their love into it so that it overflowed. However, you worry as a director if you can take all the emotions people put into an important work and make it into something that feels right. I couldn’t look at the faces of the customers on the first day’s stage greeting. Some way though, I was able to receive their thoughts and it made me incredibly happy. – What about you Yoshida-san? Yoshida: I thought beforehand it felt like a teen movie. High school girls spending time together at their club and normal third year activities packed with cuteness. There may not have been any especially moving portions, but I felt this movie was packed with things that any ordinary girl would remember from their teenage years and fondly remember those lovely everyday events. Surprisingly for me, this movie has become one of my personal favorites and I usually watch it when I just want to relax. Somehow I can’t get enough of these girls and their antics during this film. So it’s amazing that you guys could give us a little more information about the creative process of this movie. It gives more depth to the experience. Yamada and Yoshida are really amazing and the cutest when talking about this movie. The franchise is all about evoking that nostalgic sense of warm friendship, and Yamada & Yoshida themselves have become good pals from having worked together in all her projects. It makes these interviews even better.